My recent experience with Matchaeologist renewed my interest in matcha and made me curious to try a real, Japanese ceremonial-grade tea. To that end, I did some researching and found the website O-Cha, where they sell high-quality Japanese teas. I decided to buy one of their organic ceremonial-grade matchas, which came highly rated, especially for the price. I went with a decision to try a matcha that was in a similar price range as the matcha powders from Matchaeologist, but sold through a more traditional Japanese company. While the Matsu matcha was very good and interesting, I found the Matchaeologist website a bit “slick” for my tastes and I felt remiss not being able to compare it to anything more traditional. So I placed my order, and a short while later, got my package from Japan. 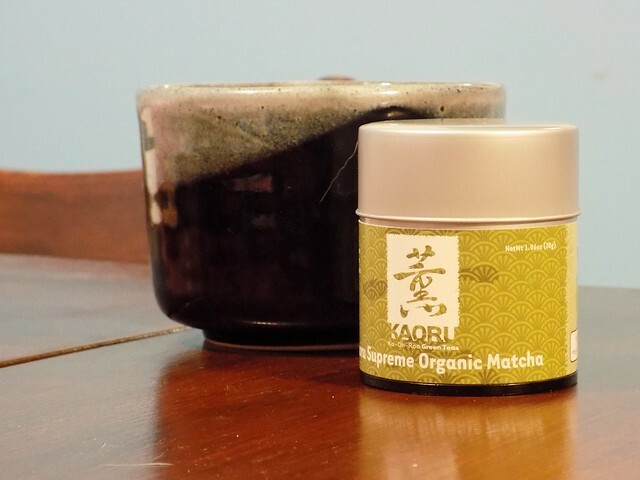 I chose the Kaoru Supreme Organic Matcha based on reviews I’d read around Reddit and other blogs. Upon opening the matcha, I was not disappointed. It has a vibrant green color and a light, fragrant scent. I prepared it both with the traditional whisking method and with an electric frother and tried it with and without sifting. This is a very enjoyable matcha to drink. It lacks the heavy, almost syrupy textured vegetal flavors of the Matsu matcha, and it displays a much more characteristic “green tea” flavor. I found the flavors a bit more delicate, and it lacked any astringency, but it had a slight acidic bite that made it actually quite pleasant, especially first thing in the morning. As with most matchas, this gives me a sense of enthusiastic vigor for life, which is why I like it as a morning drink. But the experience of savoring a cup of this tea first thing in the morning is enough to recommend it, even without any particular other benefits. I definitely would consider this a good starter matcha for those interested in getting started with the real thing, directly from Japan. NB: I purchased this product with my own money and was given no incentive to write a review. All thoughts are my own. If you are interested in learning about partnering with me, please see my contact and sponsorship page. This review does not contain affiliate links.